New honour for “Angel of Llandudno” | News by Wales Express News, People Before Profit! A WOMAN who fled to Llandudno to escape her violent husband and is now devoting her life to helping other vulnerable people has been honoured by a police chief. Brenda Fogg arrived battered and bruised with her two children from her home in Manchester with nowhere to turn. Pictured presenting the Outstanding Achievement Award to Brenda Fogg, of Hope Restored, is North Wales Police and Crime Commissioner Arfon Jones with, from left, Deputy Commissioner Ann Griffith, Sergeant Tom Prytherch and PCSO Pam Hayers. All their possessions were contained in two black bin bags, but Brenda was determined to make a new and better life for her and her children. And her success in hitting her goal was shown when she picked up the Police and Crime Commissioner’s Outstanding Achievement Award from North Wales Police and Crime Commissioner Arfon Jones. It came after she was awarded a British Empire Medal in the Queen’s Birthday Honours List. Brenda’s now known as the “Angel of Llandudno” by the people she’s helped. Soon after arriving in Llandudno Brenda founded an organisation called Hope Restored and in the winter of 2017 she was responsible for opening a pop up night shelter for people sleeping rough on the town’s streets. “When I first arrived in Llandudno I was in a right old mess,” admitted Brenda. “I had quite serious facial injuries and was in and out of hospital for weeks. 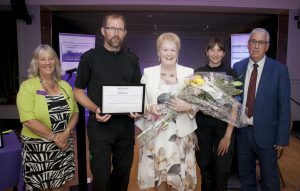 The citation said the special award was for a group or individual for a wide reaching contribution to public life and community in North Wales by helping to prevent crime and support communities. Arfon Jones himself chose Brenda for the award which was to specifically recognise someone who has made a significant and long term contribution to society as a whole. He presented Brenda with her award at a glittering ceremony at the Celtic Royal Hotel, in Caernarfon, and said: I visited Hope Restored and it has to be seen to be believed and she does it all without any public funding at all and I congratulate her on also being honoured by the Queen. Brenda became caretaker at Gloddaeth United Church on Chapel Street in Llandudno nine years ago and it was through that job that she was able to do more to help people facing the problem she once encountered – being without a home. “I began by making sandwiches for the homeless people living on the streets and then I went out at night with blankets and hot drinks,” she said. “At first there were six or seven people sleeping rough on the streets of Llandudno. Now there is an average of 16 or 17. Brenda founded Hope Restored eight years ago and it became a registered charity three years ago. “In those eight years Hope Restored has dealt with more than 500 people who have now gone on to lead their own lives,” she said. At first Brenda’s activities were based at Gloddaeth United Church, but now they have moved to the Lighthouse Community Church at West Shore in Llandudno. She said: “The church opened for a couple of nights a week for the homeless in the winter of 2017, but last winter was so cold that we had to move them into B&Bs. They spend the Christmas period in B&Bs anyway. “We find rough sleepers are made up of 75 per cent men and 25 per cent women. Women sleeping on the street are vulnerable for obvious reasons so we put them into B&Bs immediately unless they don’t want to go. Brenda says it had been her ambition to open an overnight shelter for the homeless since she founded Hope Restored because the nearest alternatives are in Rhyl and Bangor. “We have become like one big family,” she said. “We give them a big hug when they most need it to show we really care. “I’m very proud of what we’ve achieved over the years. I think we’ve made massive strides to tackle a major problem. “Food outlets like Greggs and Kentucky Fried Chicken are very good to us. Actually, everyone in the town is. “We’ve been based at the Lighthouse Community Church for more than 12 months now. Homeless people can not only enjoy a hot meal and drink in the church hall, but also a shower and they have someone to chat with. Brenda, who lives at Craigside in Llandudno, is supported by a team of volunteers – three women cook the meals at the Tuesday and Friday sessions and three men are on the floor in case someone is the worse for wear through drugs or drink. “We launched a foodbank called Bag of Hope in early February and since then we have given out more than 250 food parcels,” she said. Brenda, whose son and daughter are now in their 20s, said there is a food trolley in Llandudno’s Asda store and buckets in other food outlets for shoppers to give donations of non-perishable goods. “People are very generous,” she said. Previous articleWarning: Welsh Water has issued a fresh warning to remind people of the dangers of swimming in reservoirs.